This machine is the greatest breakthrough in hitting technology since the batting tee and pitching machine! You can perform dozens of productive and exciting drills! This Machine does it all! Satisfaction Guaranteed! You Comment: "Hitting machines are a dime a dozen and and gadgits come and go." Coach Nick's Response: Be careful what you call a gadgit. I have had many people call my inventions gadgits. However, I stand behind each and say that they are legitimate training aids. Now my products are some of the world's most respected and popular training aids. When it comes to coaching and training aids, I can assure you that Nedco Sports and Coach Nick Dixon are two names that you can trust. Our company has a lineup of impressive brands including ZipnHit Trainer, Hit2win Trainer, Hurricane Trainer, and Sklz Target Trainer. You Ask: "But it cost so much. How do I know I am getting my money's worth? I have seen other devices that cost less and were endorsed by the PROS. Nick's Response: Celebrity endorsements are certainly nice to have. They definitely sell product. In fact a good celebrity endorsement has been known to sell inferior products. Many consumers have been misled and taken advantage of Let's face it, money talks. Good products sell themselves. My products stand on their own merit. I want my customers to make their own decisions when purchasing. I want them to be happy with their purchase. Therefore, I offer a guarantee that my advisors said would never work. A 100% Money-Back Guarantee that buys your machine back if you feel it does not improve hitting skills. You see my advisors didn't really know how great my machine is. They are businessmen, not baseball or softball people. Now they are believers. With thousands and thousands of players working out daily on our machines, we have had only two machines returned. So I do have endorsements. The endorsement of improving players worldwide! 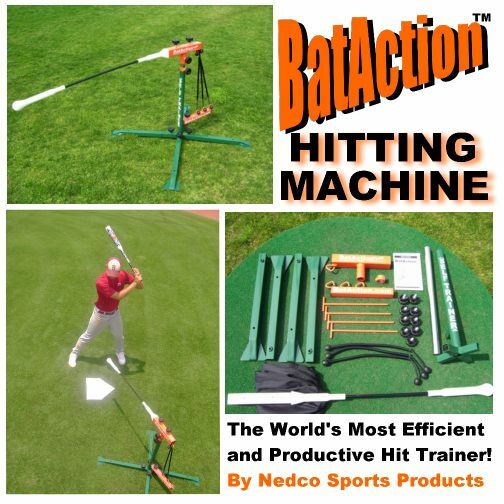 The Bataction Machine is great for BASEBALL & SOFTBALL Players! Buying a BatAction Machine is a risk-free purchase. You have everything to gain and nothing to lose, when you buy this machine. The BatAction Machine is a TRUE WINNER! Shouldn't you make sure that your favorite player has the proper equipment for maximizing workout time and quality? Purchase your son or daughter a BatAction Machine and give him or her a "Hitter's Homework Machine" that will help him or her practice and improve for years and years. The BatAction "Self-Trainer" comes with a money-back guarantee and a 1-year replacement warranty on all metal parts! I purchased the BatAction in March of this year. I'm coaching a 7/8 year old coach pitch team of the Navy Youth Sports Association in Pensacola. I use the machine at practice and for warm-up prior to each game. Your machine was a "BIG HIT"! The team batting average after 11 games is .721 compared to our opponent's jut over .300. My six year old son is batting .807, 2nd highest to a leading average of .821. We are undefeated to date with two games left in the season. As the season progresses the other teams have gotten stronger. But I think the BatAction got us in mid-season form by the first game. It enabled us to have more productive practices. My nine year old daughter is a fan of the machine also. she's batting .700 in fast pitch softball. She has improved 100% since last season. My family will soon be moving to Japan and plan on using it there as well. I just wanted to let you know how the machine has helped us this season. Thanks and I wish you continued success! I just wanted to drop you an E-mail to let you know that since my 10 year old has been using the BatAction, he now has the best batting average on his team. He also has one of the best contact hitters in the league. He loves the BatAction and his coach does also. We use it every practice. Again thanks and I hope the business is doing great! Just wanted to let you know that we received our BatAction in December and my son has been hitting on it about 3 days a week since. WOW!!! What an improvement in his strength and focus. His favorite drill is to see how many times he can hit it without missing. I bought it to improve his ability to track the ball. With practice starting this week I wish I had about 3 more of these machines to get the whole team using it. Thanks again for developing this awesome product! I have to let you and your company know what a huge difference your BatAction Machine has made to our team. I coach a 16 and under girls fast pitch softball team. In February I ordered the BatAction and received it about 1 week later. Our practices started in late March and our season began June 1st. Your machine has helped a team that over the past few years has managed only 8 wins, this year I have 2 girls hitting over .600 and 5 girls hitting over .400. To make a bright picture even brighter, we're in first place currently at 5-1. Your machine is portable,easy to take apart and setup which makes it a great asset. I am so happy I found your website and purchased this machine. It was the single best investment I have made for our team. I just thought I'd drop you a line to let you know how happy I am with your Bataction Machine. My son's average went from about .300 to well over .700. His onbase % is over .900. He makes well over solid contact with every at bat. I know I'm being selfish by not taking it to the park, but I don't like giving my secrets away. My players come to my house to use it. Our team batting average is about .680 with OB % about .800. Let the other teams do their own homework! I know these numbers are great but we're talking about 6 year olds. My son disappeared the other night; I found him in his underwear, out in the driveway slugging away on his BatAction. I really enjoy your products. Hello, Can't tell you how happy myself, my two boys and the 13-14 select baseball team are with the BatAction Machine I purchased from you back in February. I am the teams hitting instructor. Since the day I received it, this machine has been an integral part of my hitting instructions. The boys absolutely love to work with this machine! For the first time in team history, we have several boys that are carrying a 400+ BA after nine games, the remaining boys are in the 300+ range. Impressive stats based on the kind of pitching we face. The boys are more focused with clean crisp line drive swings. They now carry loads of confidence to the plate. Thank you! The machine is flat out great!